Tragedies like the recent shootings at the Clackamas Town Center and at the Sandy Hook Elementary School in Connecticut bring people together. We are horrified and saddened at the senseless and tragic killings, and know that everything possible needs to be done to prevent them in the future. Accomplishing that brings out different ideas and disagreement on how best to prevent these horrific tragedies. That’s where we can have a civil discussion, with the common goal of protecting innocent lives in the future. It’s clear that in the upcoming congressional session in Washington, DC, and in the upcoming legislative session in Salem, lawmakers will be looking at what can be done. The ideas in Oregon include increasing security in schools, providing armed responders in schools and introducing more gun control. 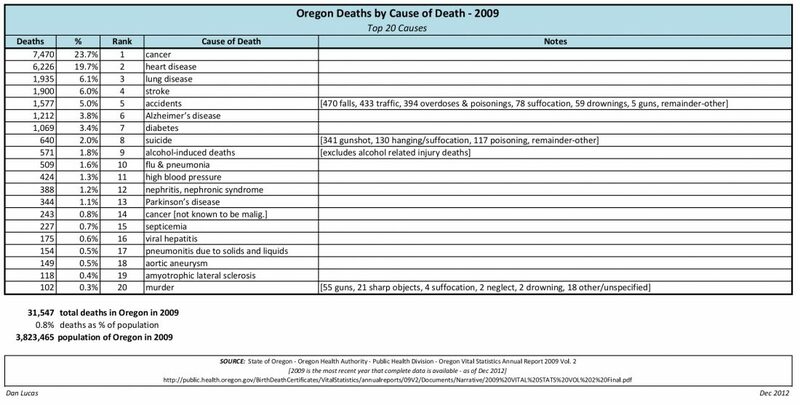 To aid in the discussion here in Oregon, and to provide context and perspective, I’ve assembled the following data on gun deaths in Oregon. Of course, gun-related deaths are just one of many factors in the discussions related to introducing more gun control. Other factors include: how many crimes are prevented by firearms (for example, did a concealed handgun license (CHL) holder end the recent tragic shooting at Clackamas Town Center?, the off-duty sheriff’s officer who stopped a restaurant/theater shooting before anyone was killed on 12/16/2012 when she shot the attacker four times, or the 71-year old man who stopped an armed robbery back in July in Florida, etc. ), how effective are gun laws, etc. NOTE: When I did my original look at the relative rates of suicide on 12/19/2012, Japan had the 7th highest rate of suicide in the world and the U.S. was number 38. As of 12/30/2012, Japan now has the 6th highest rate and the U.S. is number 34.